For years a surf holiday to Taghazout was the holy grail of detox vacations for one simple reason, getting hold of alcohol in a dry town in a muslim country was relatively tricky (not really really tricky, but a 35 min car ride to a supermarket in Agadir and relatively expensive beer). This has all changed over the last couple of years as new hotels and bars have opened up in the village. 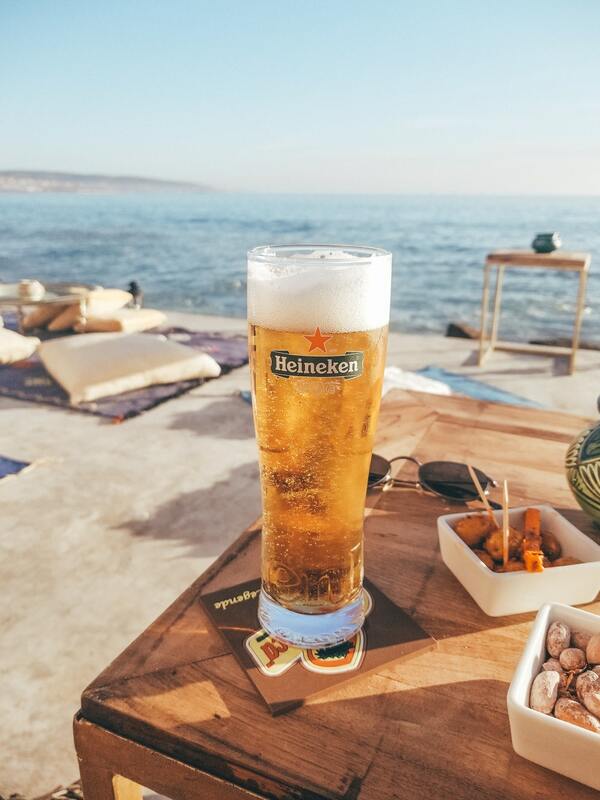 The background to it all is that Taghazout was a rural commune and as such it is quite tricky for people to get an authorisation to serve alcohol. However, if you have a hotel authorisation from the tourism office, then as part of your hotel’s license you are allowed to sell alcohol in your restaurant, et voila, in 2 years we’ve gone from no bars / restaurants to a whopping 5! So here’s the run down on the drinking options in Taghazout. Please bear in mind, none of this is with a view that hordes of stag and hen parties should ever consider coming to Taghazout as frankly their budgets wouldn’t handle the prices and there is no after party nightclub to head on to. 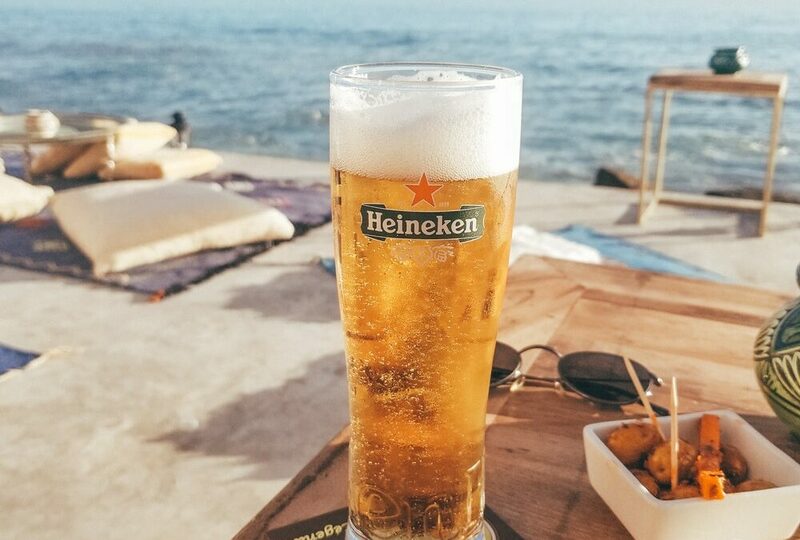 However, if you fancy a nice cold beer after a long day of surfing whilst watching the sun set over the palm trees of Anchor point…. well then this is good news. Surf Maroc’s latest venture in the area, five years of building, beset by delays and problems with the local authorities, but all worth it. It is a truly fab hotel right on the waterfront up at the North end of town, nice little infinity pool to hang out with the ‘it’ crowd (don’t worry, Taghazout is a way off this being a genuine thing, Morocco is a great leveller for anyone that has aspirations of a jet setting luxury holiday scene!). 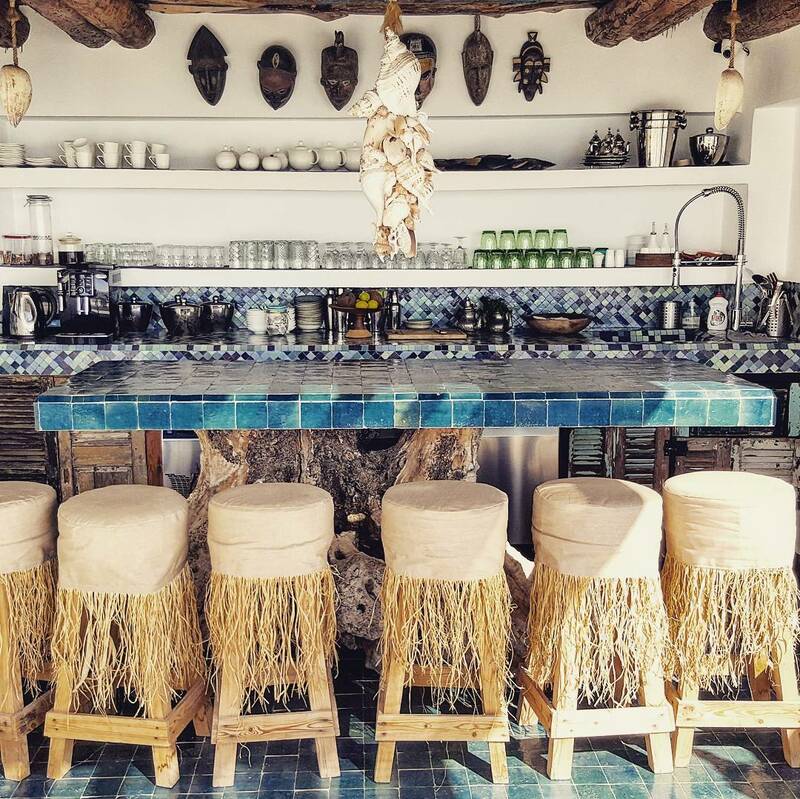 Right on the rocks of the second little bay of Taghazout you have this peaceful hideaway. Chill out on berber blankets and cushions whilst enjoying olives, nuts and a cold fresh lager. We’re most excited about this of all the place to have opened up… why, well it is on our surf shops door step. You don’t have the sea view, but you do have Mounir’s incredible design and decor to keep you entertained and you are literally 40 meters from our surf shop….. So you surf, you drop your kit, you walk 40 meters and you have a nice cold beer (Casablanca on tap amigos) waiting for you = heaven! 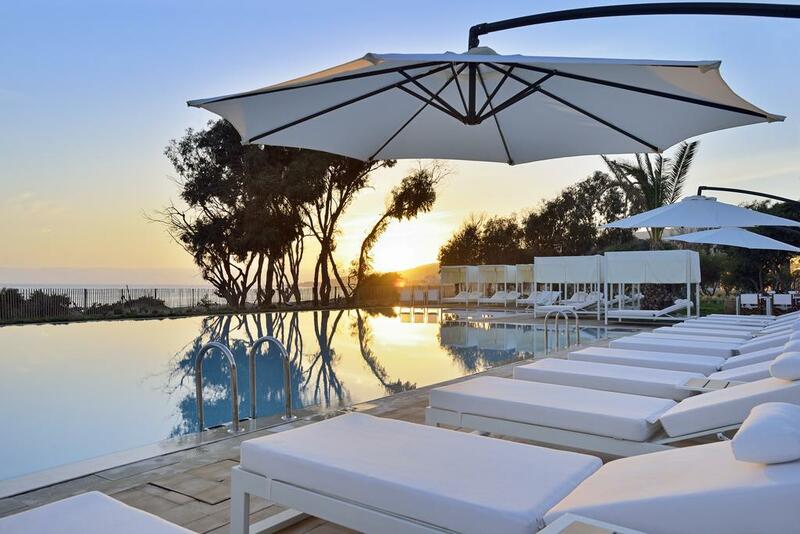 Taghazout has really upped its boutique hotel game and with a fab spot in the heart of town right on the waterfront and their chic design, World of Waves is a local favourite already. They’ve just started serving alcohol recently and it’s pretty hard to beat the view. If you don’t fancy a beer, their smoothies are excellent! OK, so you have to walk a little way to get here BUT… there are a couple of reasons why it is well worth it. 1) the walk along the new pathway to Sol House is fantastic, stunning sea views. 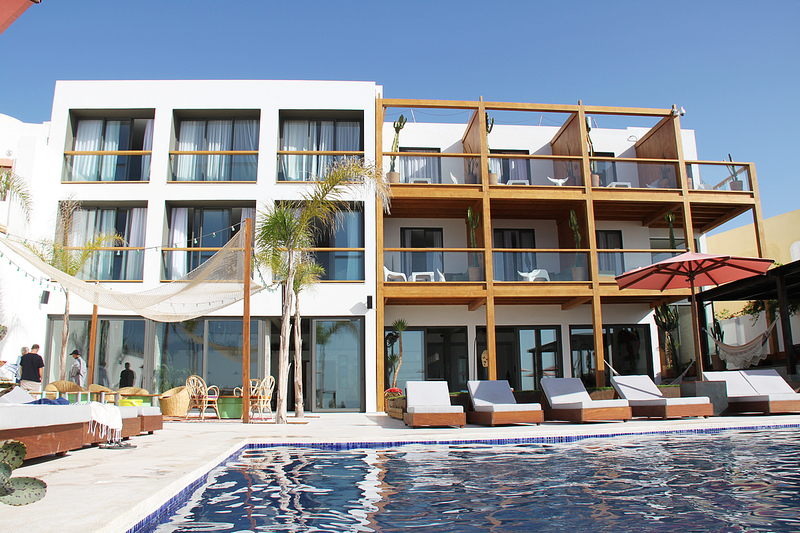 2) they have a proper swimming pool next to the bar, soooo you can do the lounging by the pool properly. 3) Being out of the village by just a few minutes brings you peace and tranquility that you can’t get in Taghazout. 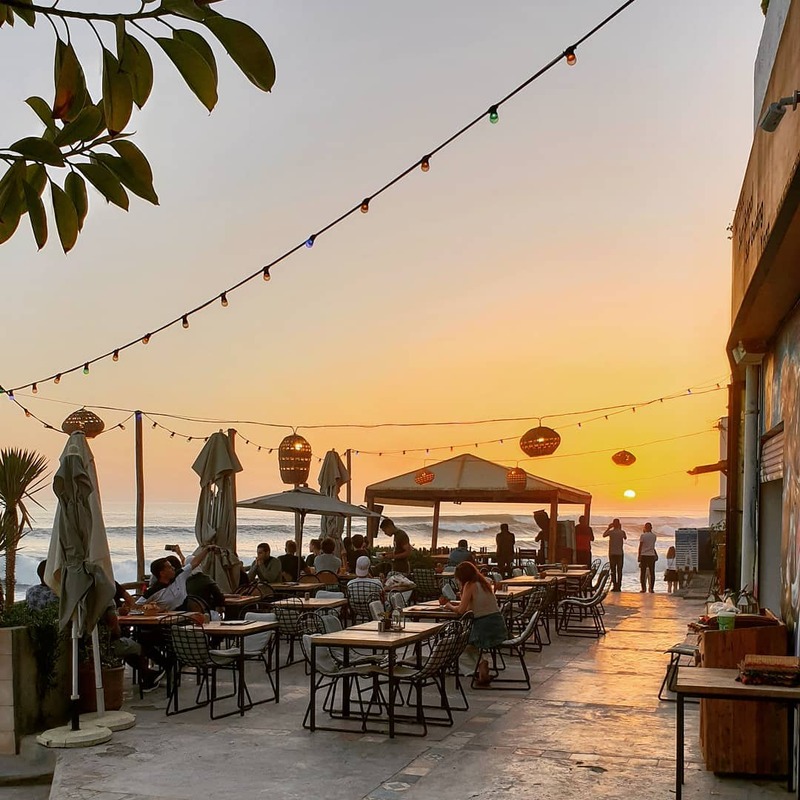 This one may be for locals more than tourists, but if there’s one thing you can be sure of in Taghazout, someone is going to come and have a chat with you and sometimes you just want a nice quiet beer as the sun goes down. We haven’t got in to prices, but expect to pay top London pub rates for your drinks. This isn’t because these places are here to rip tourists off, it is simply a result of the high duty rates on beer and alcohol in Morocco. Expect to pay 25 – 30dhs for a small beer (half pint).